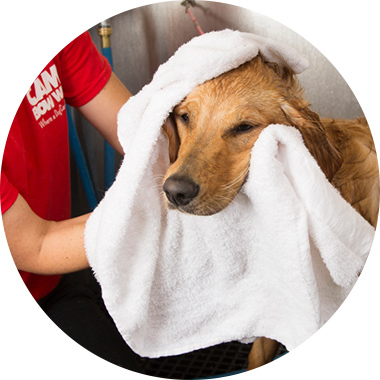 Contact us at (417) 882-9247 to learn more about our dog grooming services. Dogs up to 15 lbs. Includes bath, conditioning treatment, nail trim, ear cleaning, blow dry and haircut. Dogs 16-40 lbs. Includes bath, conditioning treatment, nail trim, ear cleaning, blow dry and haircut. Dogs 41-64 lbs. Includes bath, conditioning treatment, nail trim, ear cleaning, blow dry and haircut. Possible $5-$10 de-matting fee. Dogs 65+ lbs. Includes bath, conditioning treatment, nail trim, ear cleaning, blow dry and haircut. Possible $5-$15 de-matting fee. This includes a bath, ear cleaning, and nail trim.